Jermichael Finley: Fear. Relief. Resolve. 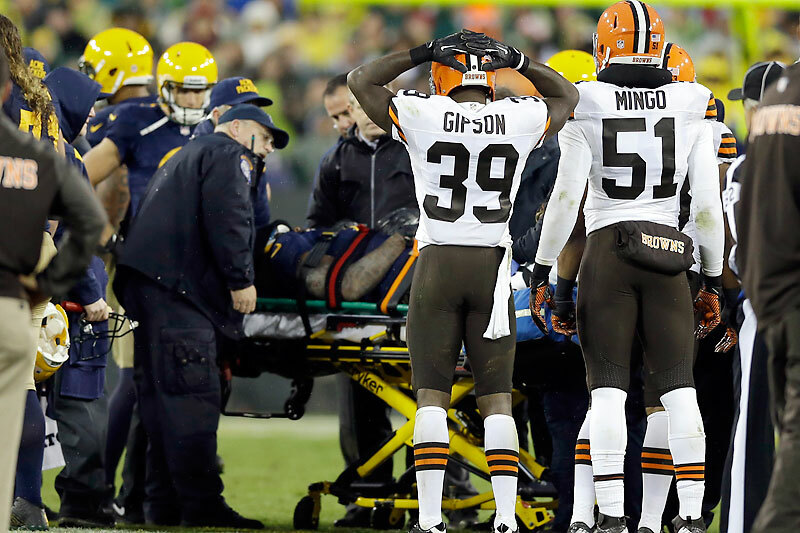 The minutes Jermichael Finley spent on the Lambeau Field turf on Oct. 20, after a collision with Cleveland Browns safety Tashaun Gipson, were a suspended surreality for the Green Bay Packers tight end, his teammates and the NFL community. Finley was taken off the field on a stretcher and spent the night in the ICU of a Green Bay hospital, before being diagnosed with a spinal cord contusion that is expected to heal. A week later, Finley describes in a first-person account for The MMQB what it’s like to confront the possibility that one play could change your life. Is this God punishing me? Is this Karma? This was my initial thought when I was down on the field. I felt as if everything that I had ever done wrong came crashing down at me at that one moment. It all happened very quickly. I remember seeing the defender out of the corner of my eye, and I intentionally lowered my head and shoulders to protect my knees. 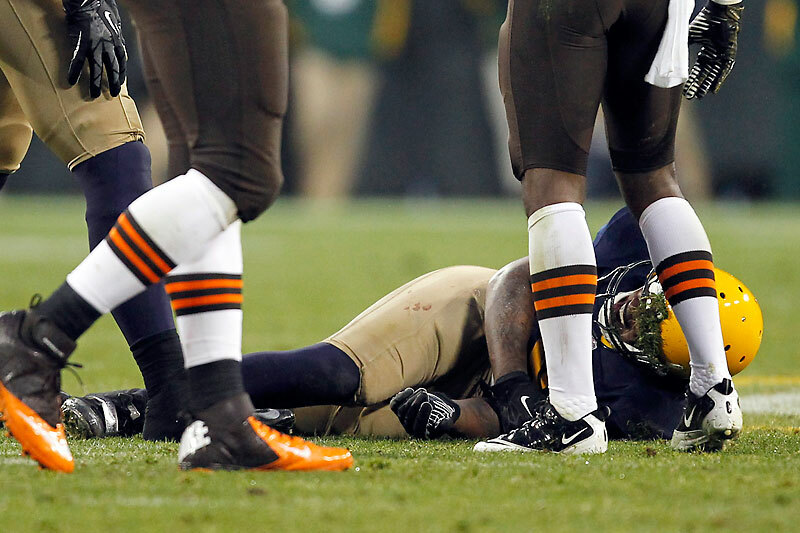 After I got hit, in the fourth quarter of our win against the Browns last week, my eyes were wide open. I was very conscious, but I could not move. 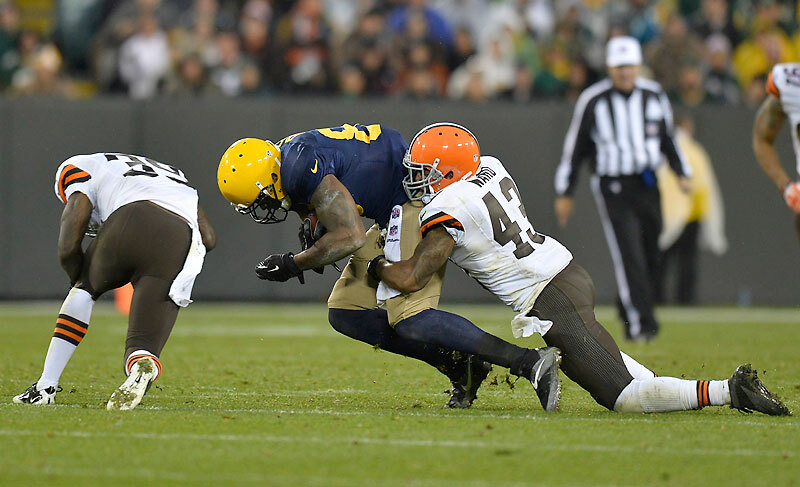 I looked my teammate Andrew Quarless directly in the eye and whispered, “Help me, Q. I can’t move; I can’t breathe.” The scariest moment was seeing the fear in Q’s eyes. I knew something was wrong, but his reaction verified it. That really shook me up. Clearly there was a problem, and I was terrified. The scariest part was the unknown. I was having trouble breathing and speaking. I couldn’t move. I was taking all sorts of tests, and no one could give me any answers. I was taken to the ICU at an area hospital, and the first night there was crazy. Everyone on my floor was facing life or death, while I was there more for 24-hour assistance. I didn’t even realize I was in the ICU until the doctor came in and told me, “Finley, you’re holding up ICU. You have way too many visitors, and even the patients that are on this floor want to come and meet you. We can’t have this traffic up here. It’s not safe.” I wanted to say, Bro, I am strapped to a board. What do you want me to do about it? However, I resisted the urge. I always joke around with friends, family and teammates, and that continued. As serious as the situation was, we kept trying to laugh. That helped a ton. My wife, Courtney, came by later that night, and we just talked about life. It was a weird dynamic. People with emergencies all around me, but life just goes forward. The scariest part of the entire scenario was the unknown. I was having trouble breathing and speaking. I couldn’t move. I was taking all sorts of tests, and no one could give me any answers. There was some concern initially that I might need an immediate spinal cord surgery. The initial CT scan came back negative Sunday night, which meant no fracture in my neck. That was obviously tremendous news, and a major blessing for my family and me. On Monday, I began to feel much better. I had started to regain motion, and I was actually able to stand up and shower for the first time since the game. My balance and coordination were still a bit off, which was alarming, but they came back as the hours passed. My grandma and father-in-law flew in from Texas, and a couple members from IFA (my agency) came in from Minneapolis. That night, I transferred into a regular patient unit, and I think about half of my teammates and coaches came to the hospital to visit me. I felt so blessed and appreciative. I've certainly been through my fair share of ups and downs in Green Bay, but it was really amazing to feel the love and support from my teammates, coaches and fans during this 48-hour period. It means more to me than I could ever explain. I underwent a series of exams (CT scan, MRI, X-Ray, etc.) to determine the extent of the injury. Monday afternoon, our team doctors and my agent sent out copies to a half-dozen spine experts around the country. It may have looked like I had another concussion, after suffering one in Cincinnati last month, but it turns out the injury is what doctors have called a spinal cord contusion. The blow shocked my spine, and left me with a two-centimeter bruise on my spinal cord that should heal in time. 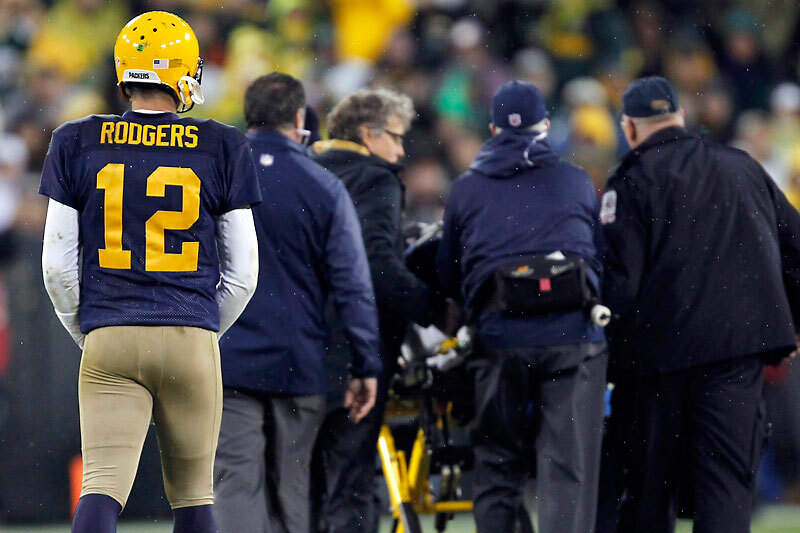 My medical treatment to this point has been superb, and the Packers and my agent have been working together to determine how outside medical experts view this injury, how previous cases have been handled and what the next steps of action should be. Right now, the recovery timeline is still uncertain, so we don’t know yet if this injury will end my season. Obviously the most important thing for me right now is to rest, and to let the contusion heal. After that, I will most likely go visit a handful of specialists around the country for thorough second and third evaluations of my neck and head. One thing that I know is that I am in great hands. I have a tremendous support system and this incident only made that clearer. I am blessed. There have been a lot of reports about my off-the-field life, and my efforts to mature as a person and as a player over this past year. I've surrounded myself with a team of people who have helped me take the next step in my life, and while I still have room to grow, I'm in a far better place in today than I was two or three years ago. One of those areas is financially. Of course I plan to play football again. That is what I love to do. I’ll do everything in my power to get back to the player I have been, and improve into the player I know I can be. My agent and financial advisers have always preached the importance of disability insurance to me. As athletes, we often feel invincible, which is why it is so important to have advisers who you can trust and who can also take the emotion out of any situation. I don’t feel the pressure that I see many athletes do because I've taken their advice. I currently have a $10 million insurance policy in place. If this injury prevents me from ever playing football again, I will be able to collect on $10 million tax-free. For me, this is the equivalent of making another $16 million or $17 million in pre-tax salary. While money has absolutely nothing to do with my decision to play, I can sleep at night knowing that regardless of what happens, my family is financially secure forever—maybe the biggest odds I’ll ever overcome. Disability insurance is never a fun conversation, and writing those annual checks to protect myself is tough. But now, more than ever, I understand the importance of protecting yourself, protecting your family, and protecting your future earnings. Of course I plan to play football again. This is what I love to do. I love the game. I love Sundays. Based on the feedback I’ve received from doctors at this point, the question is not if I'll play again, but when. There is no better feeling in the world than making the “Lambeau Leap” into the stands, and I fully intend on having that surreal feeling again soon. I will do everything in my power to rehab and get back to the player I have been, and improve into the player I know I can be. Do I have fear? Of course I do. It's impossible not to have fear given what I’ve gone through over the past four weeks. I've worked my entire life to do what I do on that football field, and it's a very scary feeling being taken off the field on a stretcher. No matter what’s said about drops or any off-the-field stuff, the one thing no one can question about me is how hard I work to be a great football player. I want this. I need this. It’s everything to me. It's a scary thought knowing I could have left that field on Sunday never being able to strap up my helmet again, let alone walk. Today, I feel better. I feel like I was in a bad car accident, but each day I’m improving. My motor skills, coordination and balance are all back to normal. I'm getting anxious sitting around all day, but I know my neck is healing. I am confident that I will be part of a new case study of players who returned to football successfully after suffering neck and head trauma. Just like we see every year with ACL recovery, anything is possible when you combine drive and commitment with a tremendous support system and team, and amazing advances in science and medicine. Before every game I play, my 5-year-old son, Kaydon, says a prayer for my health and safety. The other day, he asked me, “Why didn’t God listen to our prayers last Sunday?” I told him that he did hear us, but sometimes God helps us in different ways. "I think you're right Daddy,” Kaydon said. “He heard us and now he's getting you better and healthy so you can play football again."